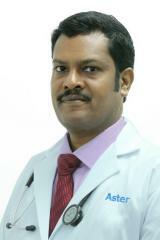 Dr. Arun Thangaraj is a Specialist Gastroenterologist at Aster Clinic, Karama (UMC), with over 17 years of experience in the field. Dr. Arun completed his MBBS (1996) from the Coimbatore Medical College in India. Following this, he went on to achieve his M.D. in General Medicine (2006) and his D.M. in Gastroenterology (2012). Prior to joining Aster DM Healthcare, Dr. Arun was working as a Consultant Gastroenterologist and Liver Transplant Hepatologist at MOIT International Hospital, India. Through the course of his extensive career, Dr. Arun has performed 4000 upper GI endoscopies, 800 colonoscopies, 100 variceal ligations and sclerotherapies, 50 PEG procedures and endoscopic dilatations and 25 colonoscopic polypectomies and nasojejunal tube placements, 10 argon plasma coagulation and 60 ERCP and a few EUS. He has also deployed numerous esophageal, stomach and colonic stents. Furthermore, as a member of the Liver Transplant team, he has helped 64 Liver transplants (62 cadaver donor and 2 living donors) in pretransplant assessment and post-transplant care till date.